Even though I knew a bit of history of the devices, and knew how they worked in theory, I was eager for a demo. Daniel Gebel, Head of Product Development at Edelrid, happily obliged, and let us film the demo too. He covers every feature of the device in the video above. Can’t see the video above? Check it out Vimeo or YouTube. Or subscribe to our Vimeo and YouTube channels to see more videos. The Micro Jul was designed to accompany their groundbreaking Flycatcher rope, the thinnest half rope on the market at 6.9mm. The problem was the Flycatcher was so skinny there wasn’t a single belay device rated to handle a rope that thin. After designing the Micro Jul specifically for skinny ropes, they realized that the belay device had so many helpful features it was worth making another one that could handle “standard” rope diameters. Thus, the Mega Jul was born, identical in functionality to the Micro Jul, differing only in what rope diameters it is designed to handle [Micro Jul: 6.9mm-8.5mm Mega Jul: 7.8mm-10.5mm]. It’s safe to say that this device is not a beginner belay device. Only when a climber has mastered belaying are they ready to test out the features of the Edelrid Micro/Mega Jul. For the advanced climber: get stoked for a device that can do everything a guide-style tubular device can, plus add on the safety of autoblocking while belaying a lead, a follower or two, and rappelling. Edelrid managed to create an incredibly small, pretty light, and super durable device, made of stainless steel instead of aluminum. The device is truly unique in that it can act as an autoblock even though there are no mechanical features. Precautionary Disclaimer: Never take your hands off the rope while belaying (no matter what device you’re using). The device will catch a fallen climber with break assist and, with practice, you can even rappel in the autoblocking mode, eliminating the need for a prusik backup. Update: Edelrid made this belay device with their own carabiners in mind. The Pure carabiner is the best carabiner to lever the device. The Strike carabiner is best for belaying. The belay carabiner needs to fit in the grove of the belay device (see photo below). Wider carabiners, like the DMM Belay Master, will struggle to fit its bulk into the groves. 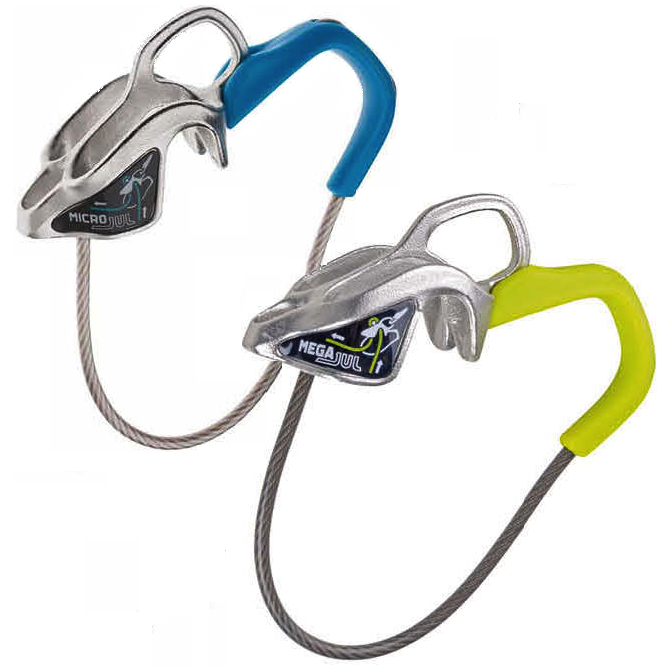 When the carabiner doesn’t fit into the grove, the aluminum carabiner will sustain scratches from rubbing on the edges of the steel belay device and the device may feel jumpy. The standard rappel mode is using the device flipped (thumb loop pointing towards you). Rappel like with any other tubing device. This would be the way to use the device most often (for time/safety/ease). using single ropes: IF the rope hangs straight from the rappel anchors (and does not run over an edge). The less straight the rope line is to you, the less the device will work smoothly. 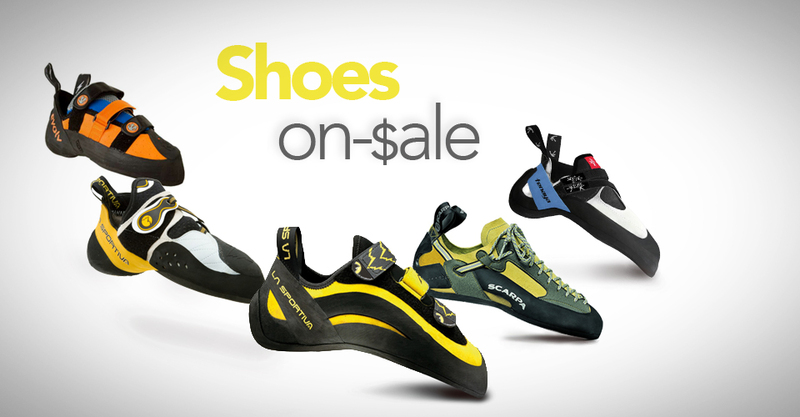 We had a great time talking with the guys at Edelrid (check ’em out on Facebook). Their passion for climbing and the pride they have in their work is evident in their excitement and energy. While many of our meetings at Outdoor Retailer were 30-60 minutes, we spent over 2 hours at their booth immersed in total gear geekery. Their response was akin to, “well, it’s not dangerous.” Maybe not, but kind of uncomfortable. The design, though, has it’s merits. If they bombproof it, I’d try it. Thanks for bringing up this concern! There were two batches of Edelrid Micro Jul’s (batch 1/13 & 2/13) that had issues with the wire pulling out (the Mega Jul never had this problem, nor did any other batches of the Micro Jul). The problem was that the machine stamping the wire into place wasn’t stamping it correctly. Since this discovery, Edelrid has added an extra step in their process to ensure no weak wires get out and the stamping machine gets the job done right. Thanks to your inquiry, we’ve also updated this post with a few extra tips from Edelrid about carabiner use. Thanks for addressing this. One concern though, you said that the Mega Juls weren’t affected, however, those pictures I linked to clearly show Mega Juls. I’ve seen some pictures of Micro Juls with the problem also. It’s nice they got back to you, but with poor information.